Recently I’ve visited the museum “CORPUS Reis door de Mens” in Leiden, and until now it’s my favorite museum. It’s a museum-attraction with a very well integrated storyline, consisting of one-hour journey and a large activities zone. The storyline is simple but very fun, where the eaten hamburger plays the role. During the journey you as a visitor is constantly triggered with a feeling “And what’s next…“ expecting surprises, what makes it exciting. There are several 4D small theaters with short films. For example, in the heart area the chairs are moving in rhythm of the heartbeat and there are other effects. Different senses are involved: different smells in the nose area the dampness in the mouth area, etc. You have the earphones on and the voice tells you the story. You don’t have to press the buttons. The sensors identify where you are and the voice continues the story. It’s told in a very engaging manner with lots sense of humor. Everything in the museum is very well-thought out. After the journey you appear in a small cafe zone with the great panoramic view and the telescope. Just the ideal moment to have a break and drink something. Then you can continue with the activities zones, gradually descending down. There are different, attractions, interactive games, quizzes, films – all related to the person (health, emotions, abilities, self-knowledge). 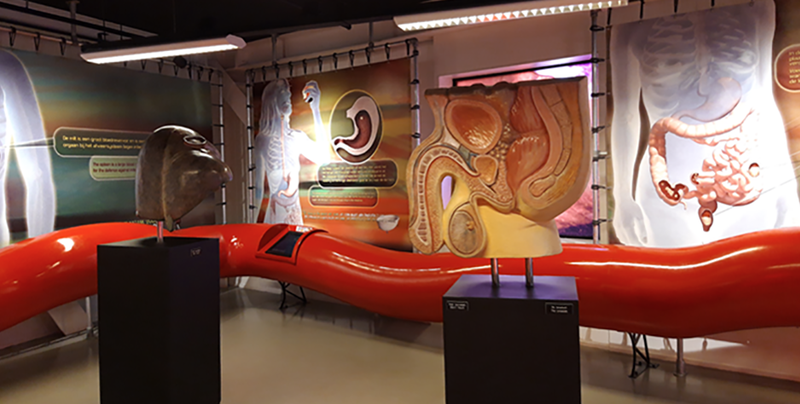 These small attractions are integrated by different health and environment organizations (partners/sponsors), like Dunea (interactive simulators/bikes), Wageningen Universiteit (“Goed eten” small attraction), Kanker stichting (“Goed smeren” interactive game) and others. It’s fun for kids, it’s the value for the museum and promotion for these organizations – very clever concept. And all under the common motto, which promotes the healthy and happy style of life. When you go down the stairs you read fun facts on the wall, like how many calories you burn when you go up or down the stairs. Finally you are at the ground floor in a bigger cafe room, with some smaller fun attractions and the shop. The parking is also very easy and comfortable. When you at home, you get from Corpus the personalized “Corpus Courant” with overview of activities and your personal test results, if you did any. In short, Corpus is pure joy, the place you want to invite other friends and visit it again. It’s a great example of successful future museums.